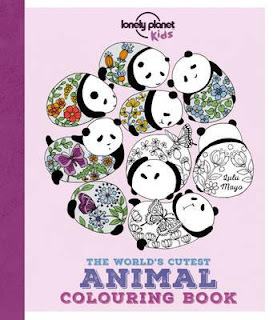 From the moment I opened The World’s Cutest Animal Colouring Book, I fell in love and hugged it tight. Now, you might be curious as to why, and you might be thinking that surely a colouring book is only a collection of black and white pictures. And if you are, I am excited to share this review with you because this colouring book is something special and unique. Firstly, the illustrations by Lulu Mayo are divine pieces of art, worthy of a frame and place on your wall. They are intricate, detailed and interesting, and they feature beautiful animals from across the world, presented in gorgeous scenes and patterns. The drawings alone make this book extraordinary, but its true gift is the additional, COLOURED pictures you get along with the black and white versions. With a glorious palette and detailed shadings, these stunning illustrations will make you beam and likely want to ban anyone with peanut butter on their hands from ever touching the book. Your budding junior artist (minus peanut butter hands) can choose to copy the colours from the artwork on the left hand side, or they can go wild with their own colour choices. At the back of the book is a large map showing where all the featured animals come from, as well as a double page spread providing facts about each of the magnificent creatures. The World’s Cutest Animal Colouring Book would make a most amazing gift for a young art lover. That said, the illustrations remind me so much of adult colouring books that I dare say any colouring lover will adore this book. I truly never knew a colouring book could be so magical, and I am so happy I have discovered their amazing potential.